Liriodendron chinense (commonly known as the Chinese tulip poplar, Chinese tulip tree or Chinese whitewood) is Asia's native species in the genus Liriodendron. This native of central and southern China grows in the provinces of Anhui, Guangxi, Jiangsu, Fujian, Guizhou, Hubei, Hunan, Jiangxi, Shaanxi, Zhejiang, Sichuan and Yunnan, and also locally in northern Vietnam. Protected populations occur in the Tianmushan National Reserve, Huangshan, Wuyi Shan, and Badagongshan Nature Reserve. Trunk of L. chinense with epicormic shoots showing a purplish tint often seen in juvenile foliage of this species. Liriodendron chinense is very similar to the American species, Liriodendron tulipifera, differing in the often slightly larger and more deeply lobed leaves, and in the shorter inner petals in the flowers, which lack the orange pigment of L. tulipifera. 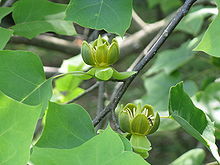 The Chinese tulip tree reaches about 40 metres (130 ft) tall. It is not as hardy as the American species, but is cultivated on other continents as an ornamental tree. It is grown in England (where there are many at Kew Gardens ), Ireland, Belgium, the Netherlands, and Germany. In North America, it grows as far north as Boston, Massachusetts, in the east, and Vancouver, British Columbia, in the west. It is a street tree at the University of Victoria and along the Veterans' Memorial Parkway in Langford, British Columbia. In cultivation it grows as fast as the American tulip tree. A cultivar (J.C.Raulston) with leaves larger and darker than typical has been developed in North Carolina. In the United Kingdom L. chinense has gained the Royal Horticultural Society’s Award of Garden Merit. ^ a b Phan, K.L. (2015). "Liriodendron chinense". IUCN Red List of Threatened Species. IUCN. 2015: e.T31284A2803363. doi:10.2305/IUCN.UK.2015-2.RLTS.T31284A2803363.en. Retrieved 2 July 2017. ^ Xia Nianhe; Liu Yuhu; Liu Yuhu; Hans P. Nooteboom. "Liriodendron chinense". Flora of China. Missouri Botanical Garden, St. Louis, MO & Harvard University Herbaria, Cambridge, MA. Retrieved 25 May 2012. ^ "RHS Plantfinder - Liriodendron chinense". Retrieved 25 March 2018. This page was last edited on 13 June 2018, at 06:22 (UTC).